General view from the south-east, showing the rounded Romanesque apse. Another view from the north. Apart from the corner of the nave which is Saxon, some mediaeval windows and a 19th-century restored bell-cote, the whole church dates from the third quarter of the 12th century. It is a particularly rich example of the late Romanesque style and shows strong Scandanavian influence. 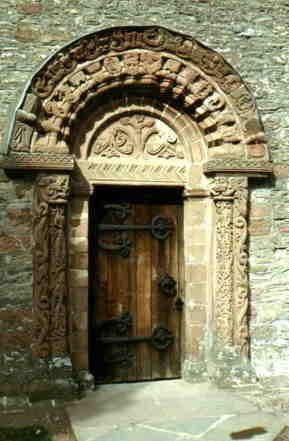 The south entrance doorway showing the tympanum. Tree of Life, with warriors in the foliage and dragons on the door jambs. 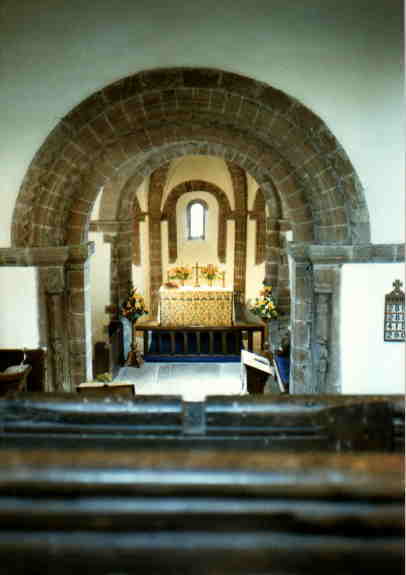 The Norman chancel arch, viewed from the west gallery, and from ground level. Detail of the rib vaulting in the chancel apse. Regarded widely a England's most perfect Norman church, it stands on a mound next to a ruined castle between the Wye and Dore valleys. It was originally also next to a Benedictine priory and remains as it was built, i.e., with nave, chancel and apse, with no aisles or tower. Nothing has been added or taken away, and the carvings remain as they were, almost as pristine as the time when they were completed. They cover the west and south doorways, the chancel arch and the corbel-table which runs round the entire church. The carvings which form the shafts of the chancel arch on its west side comprise three elongated figures of saints, and are unique in England in that the sculpted figures are raised rather than incised. Two views of the west gallery from the chancel arch. Detail of the seating in the gallery. The Norman font under the gallery. 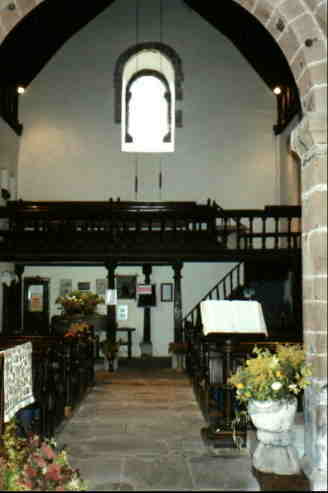 The eaves of the church are decorated by numerous carvings on the corbels used for supporting the roof timbers (the "corbel-table"). These range from animals, - a pig upside down, dos rabbits, doves, - to musicians, wrestlers, acrobats, a sheela-na-gig, and faces of people of the time; a depiction of the life and times of the village and its people which the church served. Quite possibly a contemporary Beastiary was used as a source of inspiration for the carvings. Above are drawings by Reg Bolton © taken from notelets, and the book The Sculptures of Kilpeck (both on sale in the church), of just four of them.